On January 22, 2003, Christendom College will join the 100,000+ pro-lifers at the 30th March for Life in Washington, DC. The College routinely cancels classes on the day of the March, and the Student Activities Council charters as many buses as needed to transport all 350+ students, and numerous members of the faculty and staff to the March. This year the College will take six buses and several 15-passenger vans. In 1984 and 1997, Nellie Gray, President of March for Life, honored the College by asking Christendom students to carry the main March for Life banner and lead the March down Constitution Avenue. In fact, in the unfortunate event that abortion is still legal in 2008, Nellie Gray has already booked Christendom College to lead the March that year. But Christendom’s pro-life efforts do not end with the annual March for Life. Each Saturday, after attending 7 a.m. Mass on campus, a group of Christendom students under the title “Shield of Roses” travels to the Washington, DC, area to peacefully protest and pray outside an abortion mill. This tradition was established at Christendom in the early ‘80’s and continues up to this day. Christendom’s motto, “To restore all things in Christ,” is more than just a motto for the students. It is their mission and their way of life. 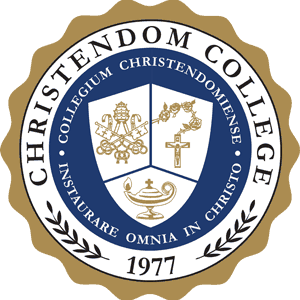 Through the vigorous moral and academic education that they receive at Christendom, the students are well prepared to enter society and the workforce as “Soldiers for Christ,” dedicated to the restoration of all of Christendom.